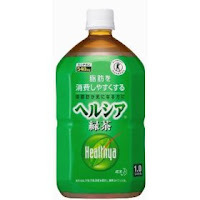 There is this green tea here in Japan called "Helthya" (へルシア) that supposedly assists in loosing weight. The magic behind it all is that they've filled the drink with an excessive amount of catechin. In one 350ml bottle, there is 540mg of catechin in there. Even drinking it is hard because it's such a strong brew of green tea. I bought a 1L bottle today, and they have each 350ml well marked off with a warning saying (translated) "We recommend you only drink 350ml a day". I'll probably end up drinking half today and the rest tomorrow, though. Warnings be damned! I wonder if it actually works, though. I've known about this drink since I came to Japan but I'd always opt for the better tasting (read: way less strong) Kirin Namacha (キリン 生茶) or Suntory's Iyemoncha (伊右衛門茶) , which are my two all time favourite chilled green tea drinks. If any of you are in JP and feeling adventurous, you should buy a bottle... or 12 off Amazon for cheaper! Hey, that's pretty cool. Read your Wiki article linked: Harvard Medical School says that catechins actually reduce the incidence of stroke, cancer, heart attack, and diabetes. As a wealthy westerner, that's everything you're mostly likely to die of! They want to classify it as a vitamin. I guess some people eat dark chocolate (or cocoa in some form) to increase their catechins, but then you often get sugar and fats thrown in with it. Green tea sounds like a really healthy option! mmmmmm dark chocolate. I don't know, the 99% stuff barely has any sugar in it haha. But yea, green tea is pretty awesome. I love it. I'm going to miss (again) not being able to run down to the corner and pick some up.